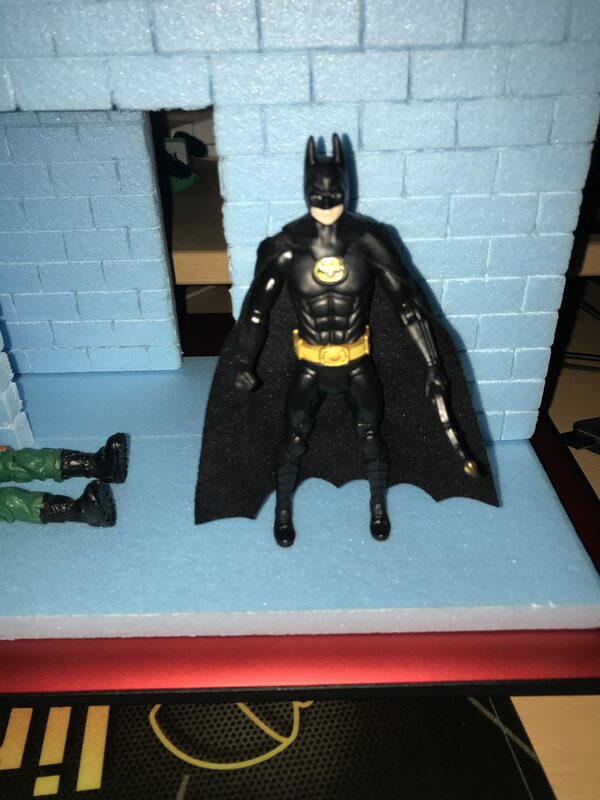 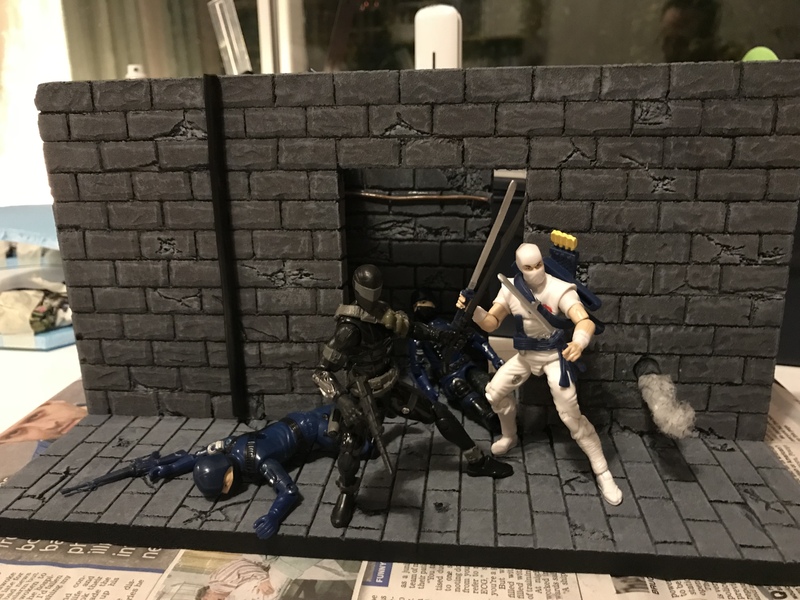 Last night I started a new little project, for 3.75” figures. 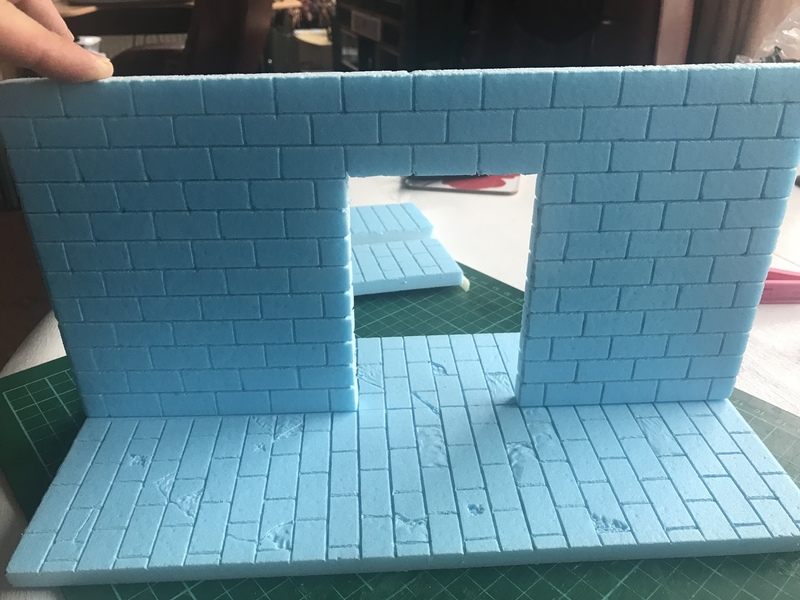 Using insulation foam board, I’ve cut a piece 6” x 12” for the wall. 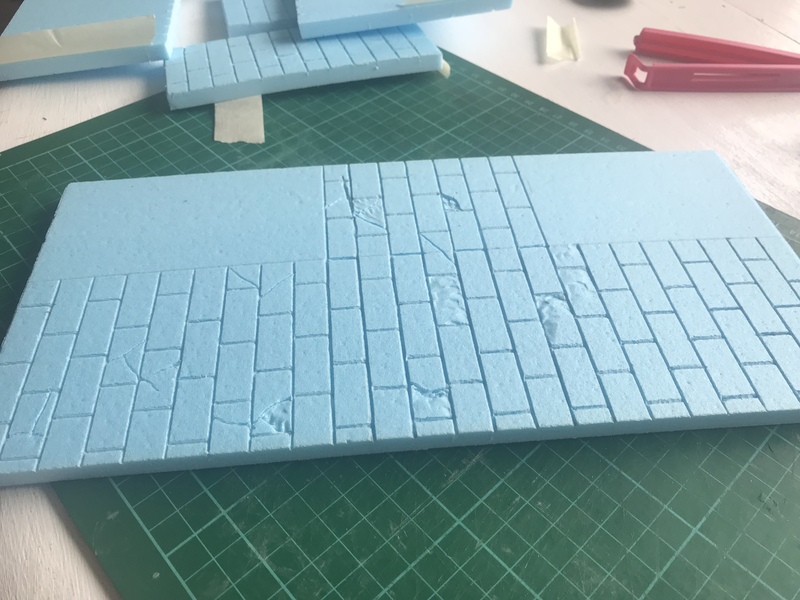 Marked out and engraved the brick work onto the front. 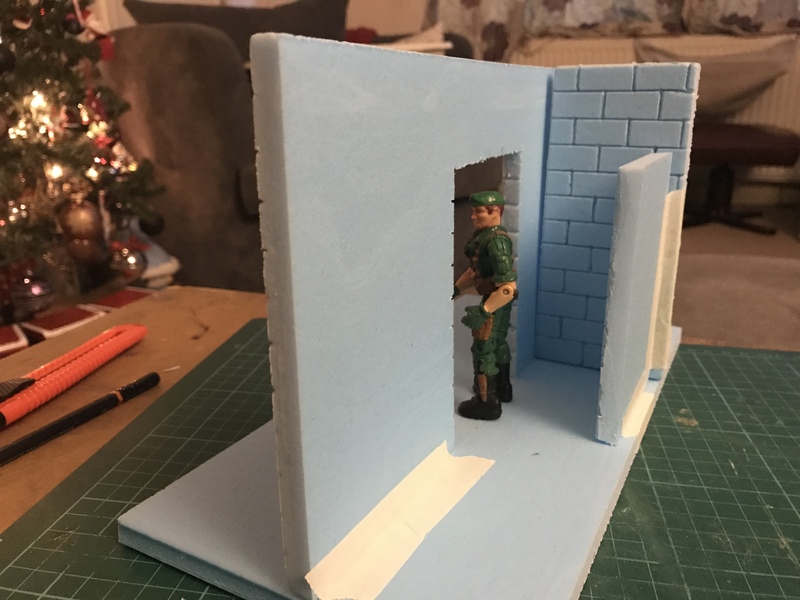 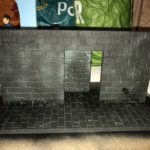 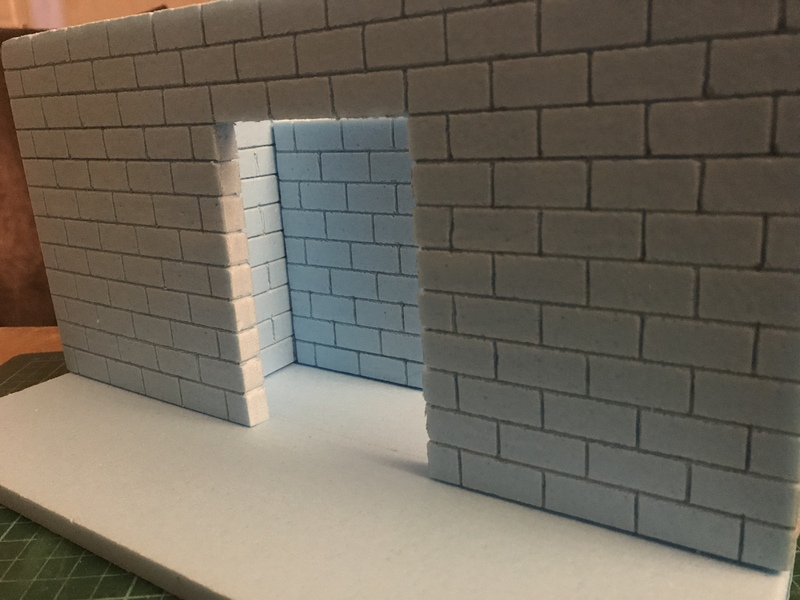 Cut out a doorway, made up a small wall to sit behind the door, used the cut out for a small wall behind the door. 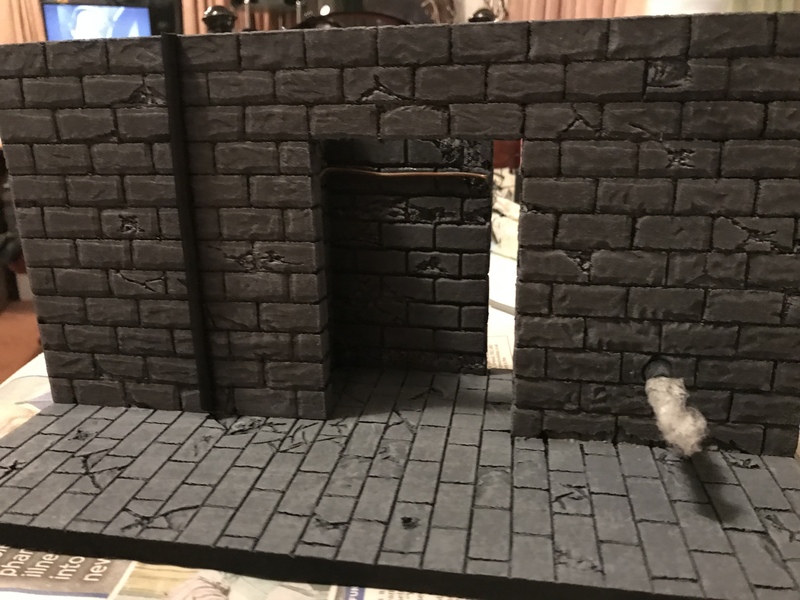 The base is another piece of foam board 9” x 12”. 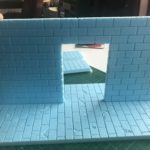 The time has been spent bricking the floor then adding detail to all the brick work. 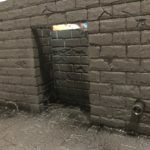 Taking an ordinary pen and cutting the of the end, this was placed through the outer wall to act as ventilation pipe. 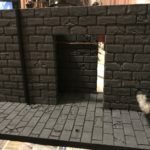 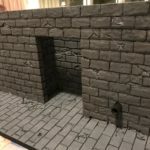 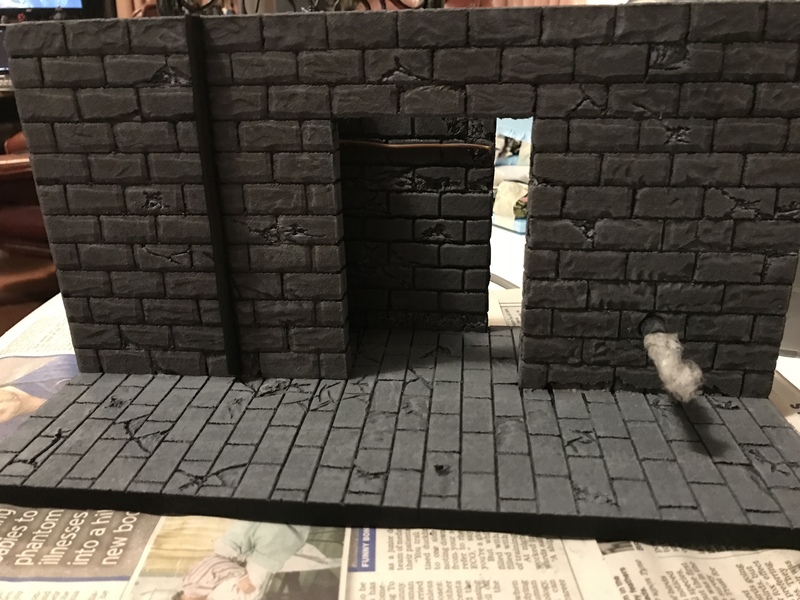 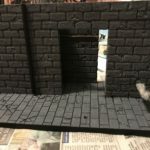 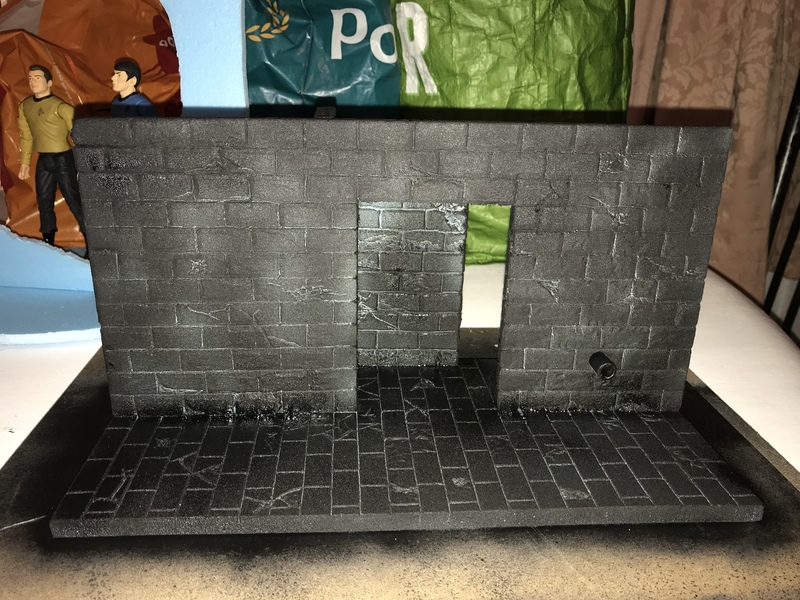 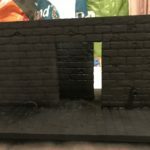 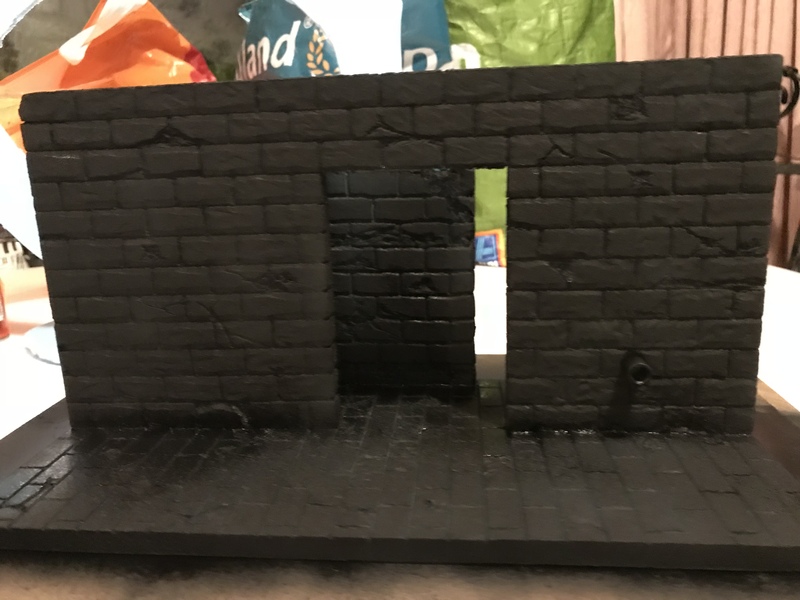 I have given this piece and complete undercoat of black paint, now I can start to build on the brick work. 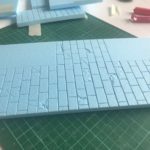 Mixing up a blue/grey acrylic, a coat was applied to floor. 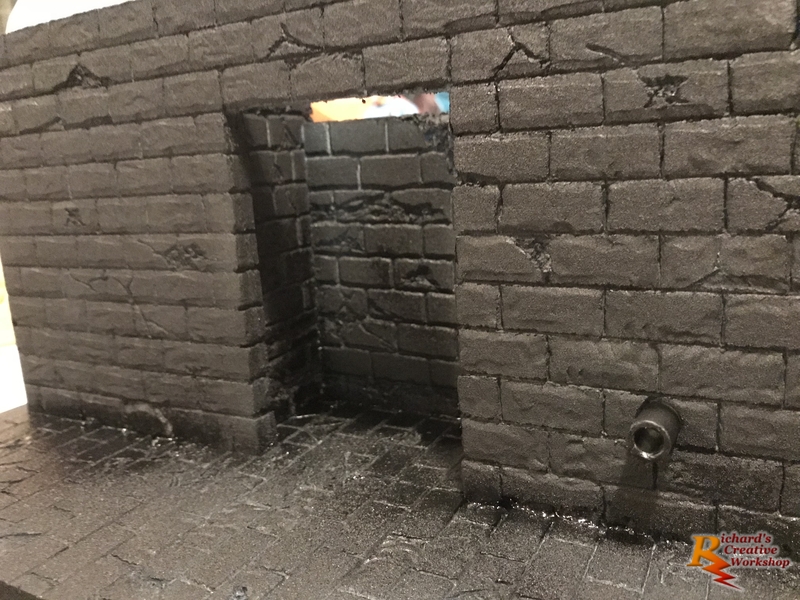 Then mixing some burnt umber with the grey, this was then applied to the wall. 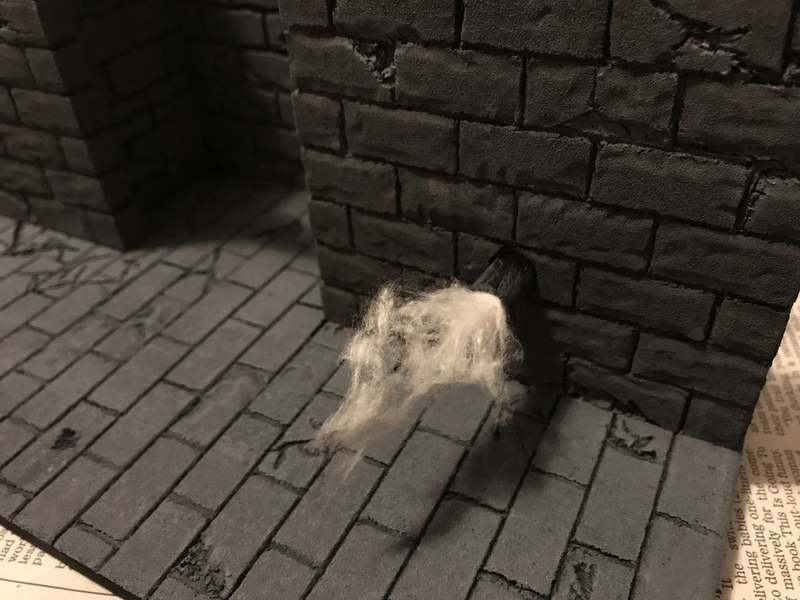 A lighter grey was made, this was used for several dry washes across the floor and walls. Gently pulled apart cotton wool was used as steam coming out of the pipe in the wall with a combination of grey and black paint dabbed into it. 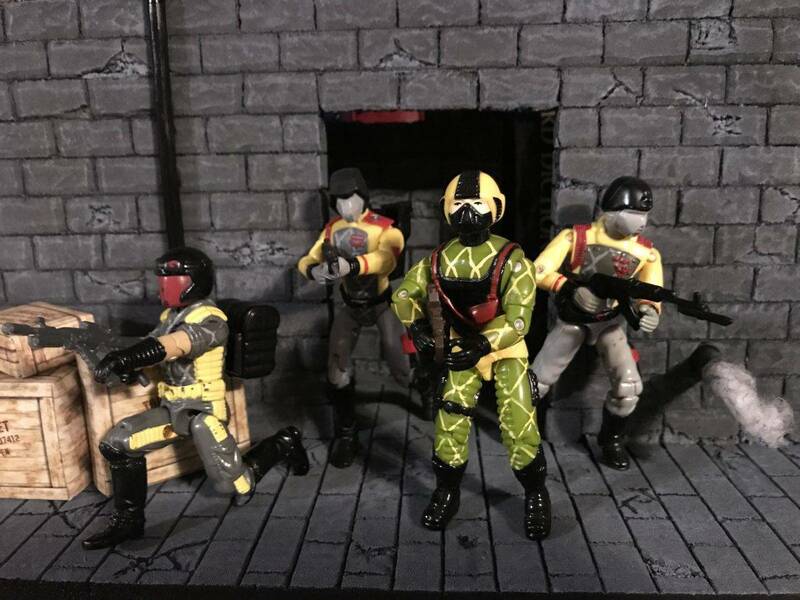 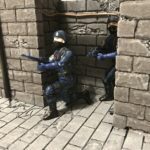 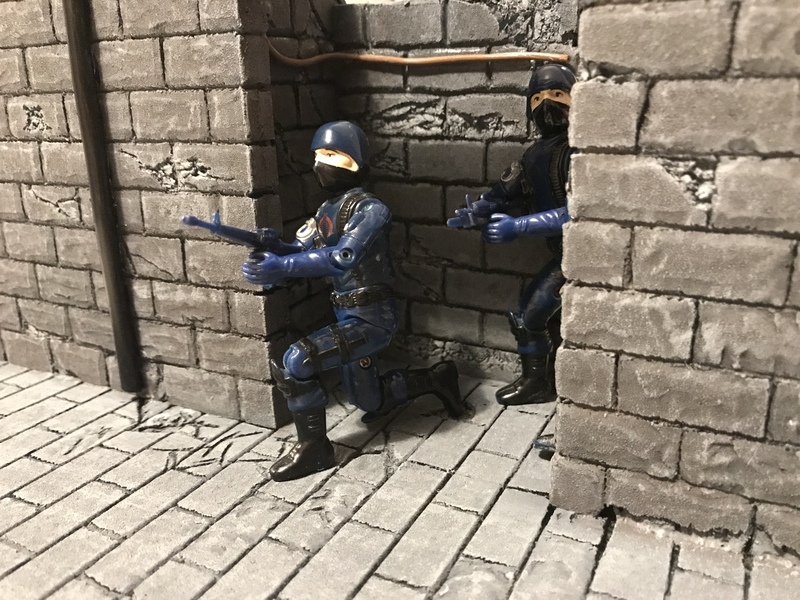 Enjoy some action shots before the final pictures are added. 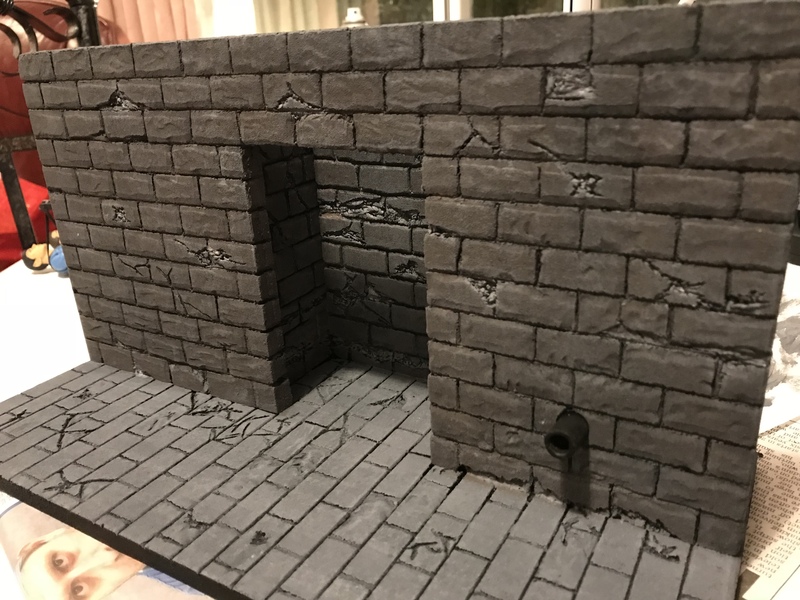 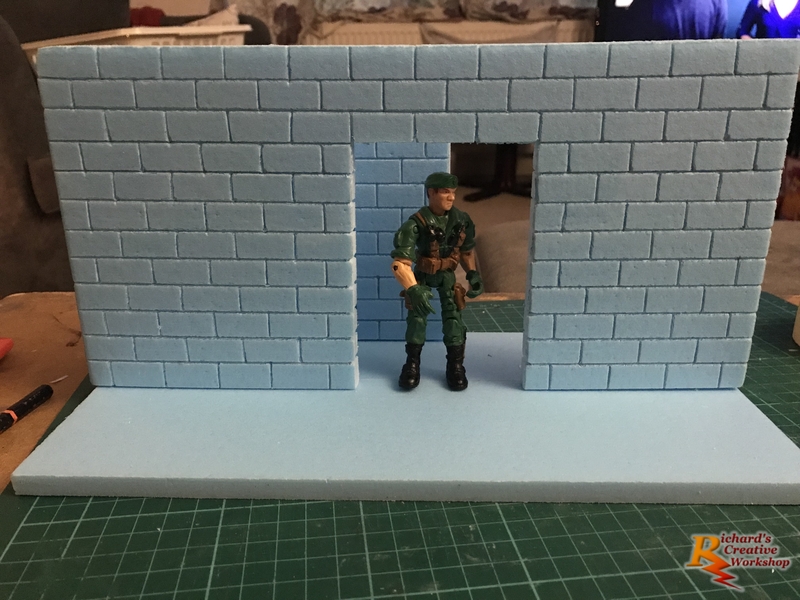 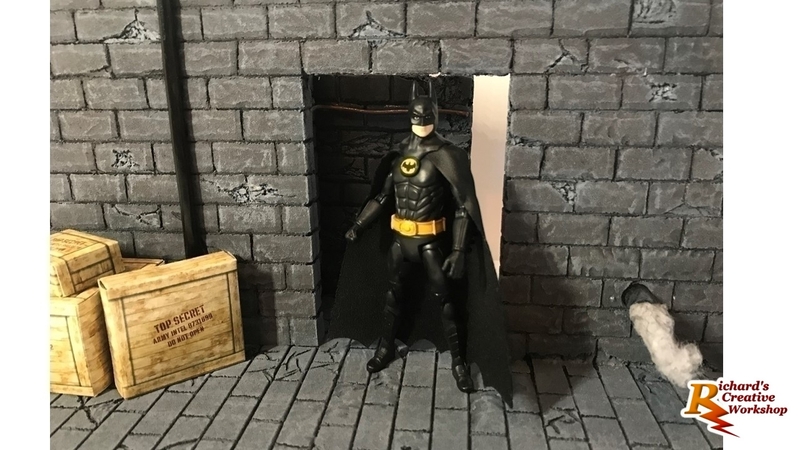 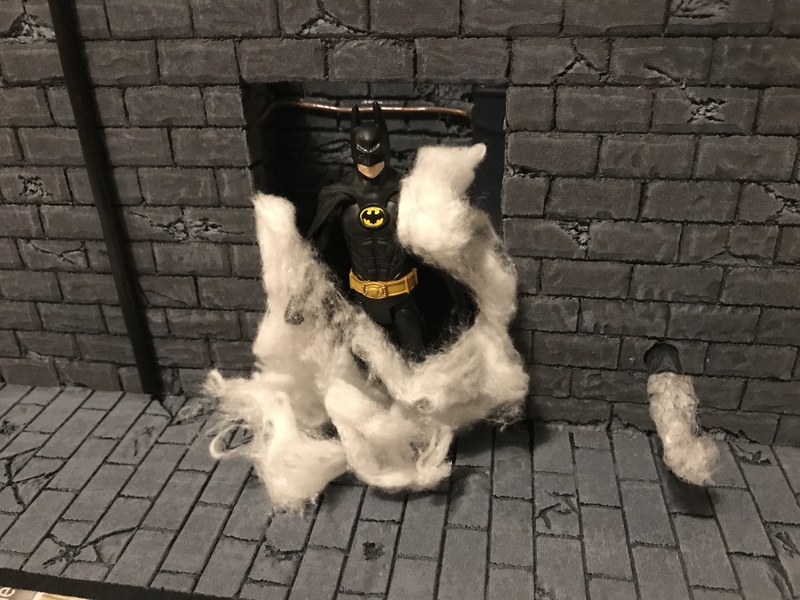 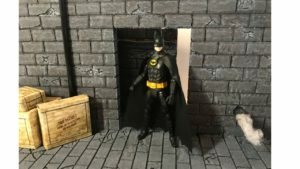 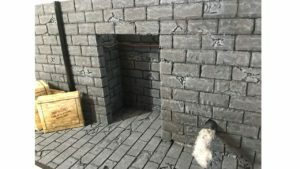 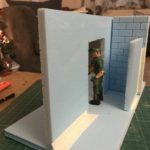 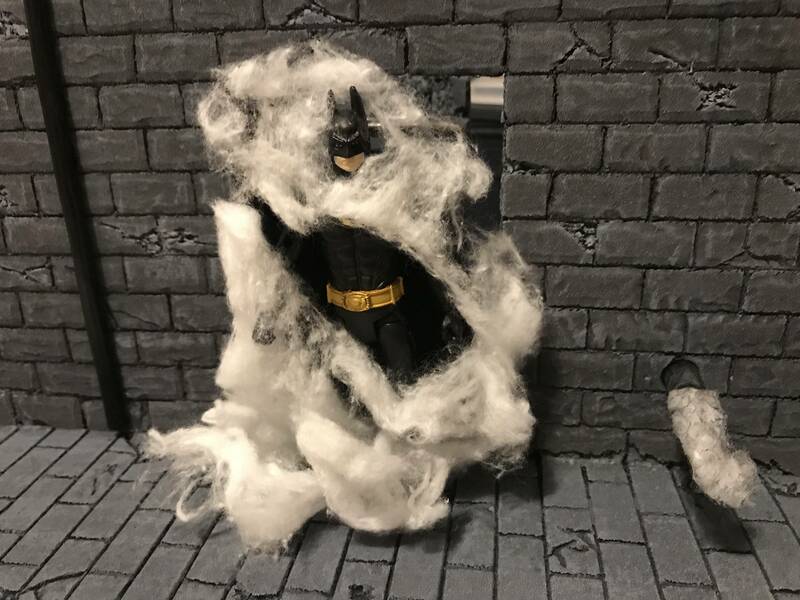 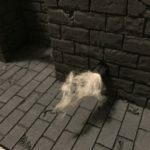 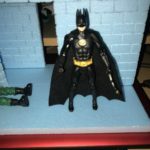 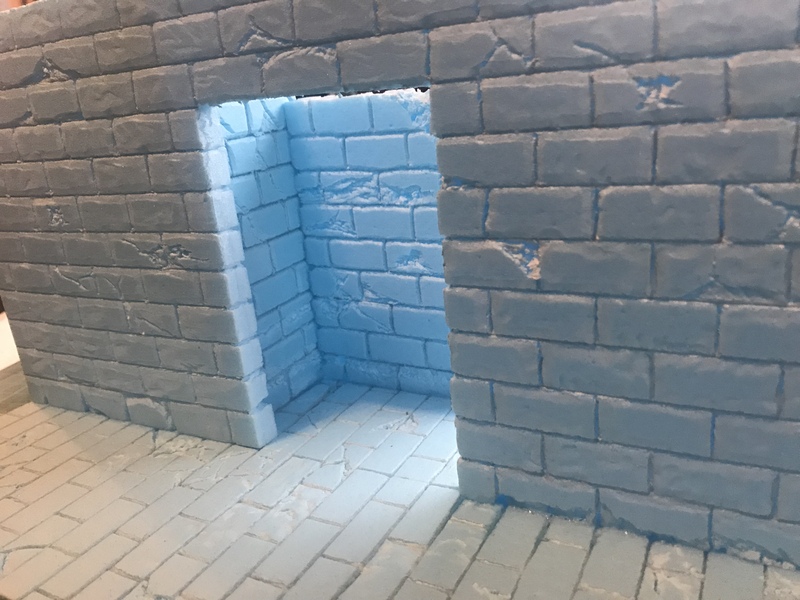 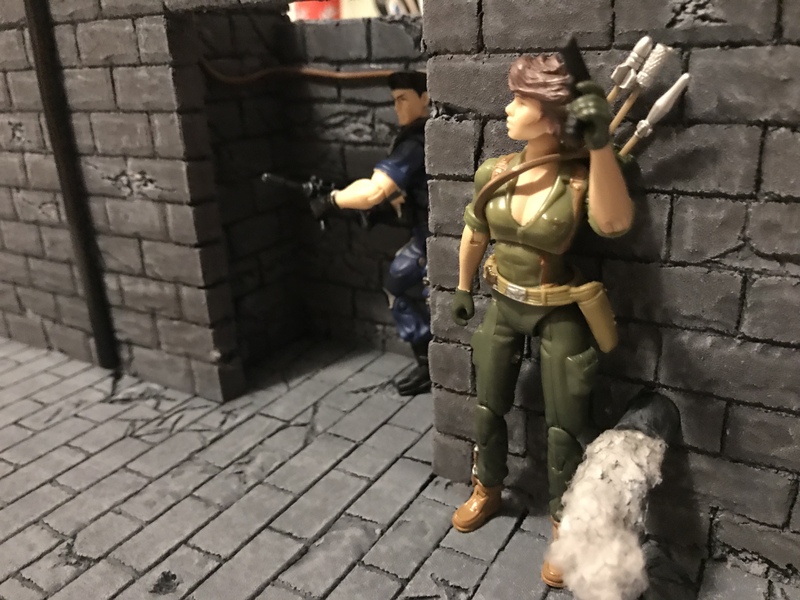 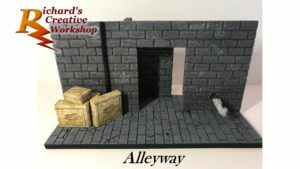 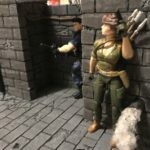 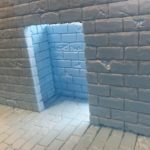 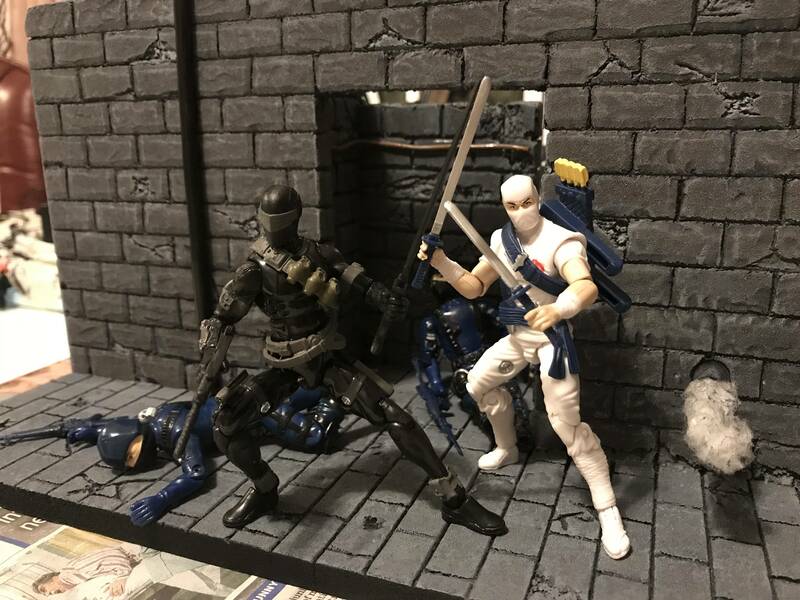 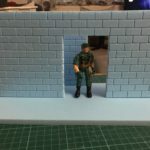 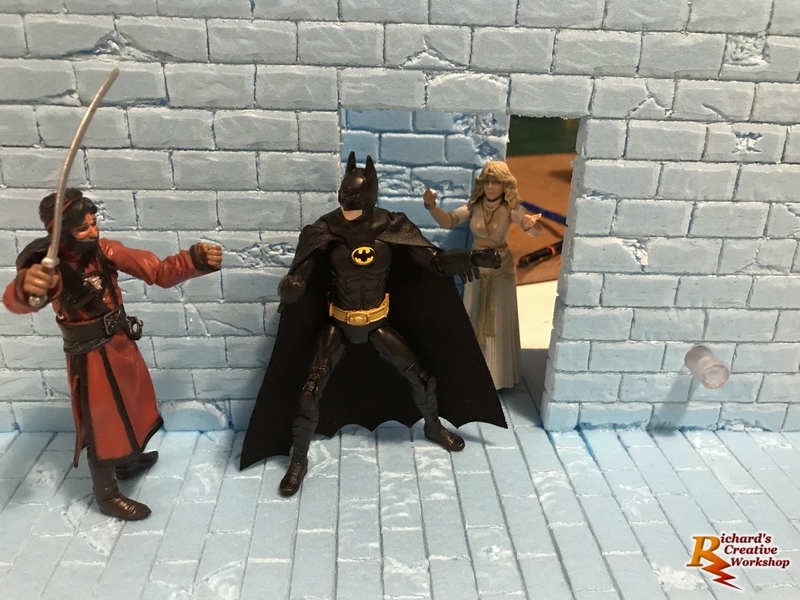 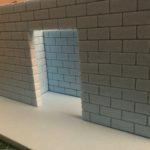 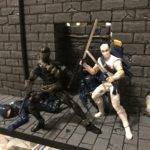 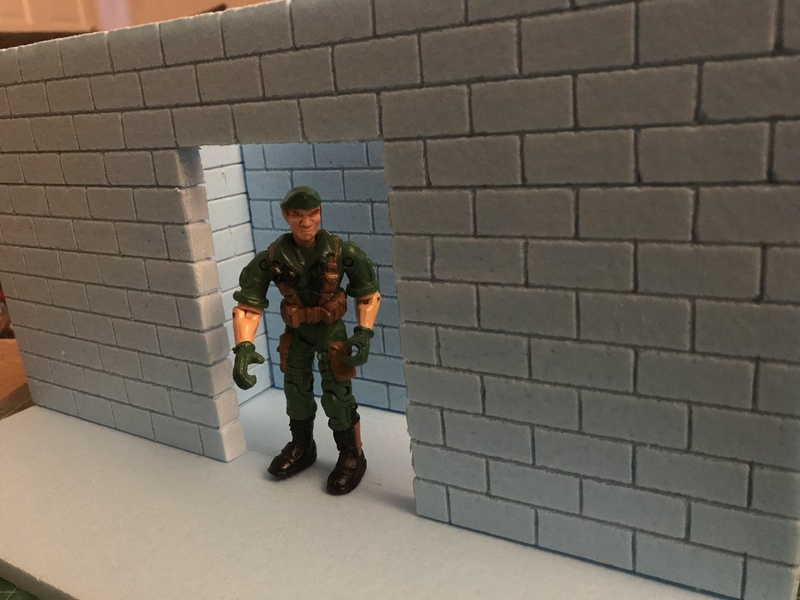 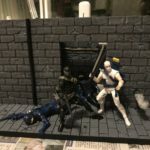 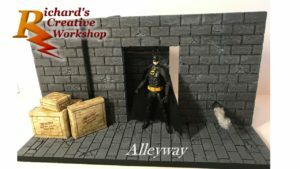 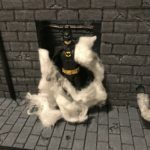 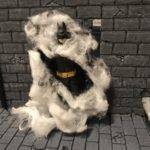 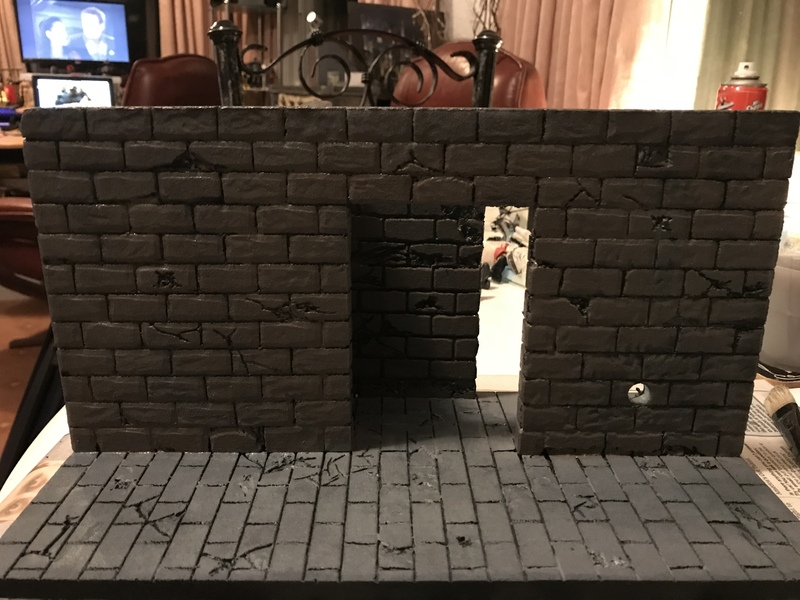 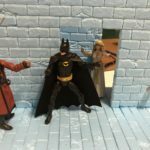 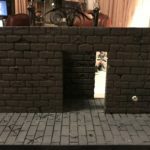 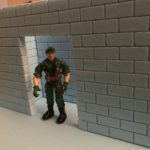 Final pictures of my Alleyway diorama for 3.75” figures.